Excerpt of improvised set for light-sensitive synthesizer and amplified electro-magnetic interference with projection. ruby is a handmade, 3-oscillator synthesizer whose frequencies are modulated by the light levels of a CRT baby monitor with wireless camera. Adding a harmonic/drone element is a set of voltage-mismatched power supplies and transformer – the unsounds, whose electromagnetic frequencies are amplified and processed. Part of the Inga Maren Otto Music Fellowship presentation at the American Academy in Berlin. 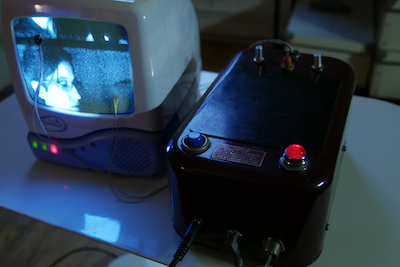 Two photocells attached to the screen of the black and white monitor are connected to two of the synth’s oscillators. By dynamically adjusting the brightness, contrast and, thanks to its analog nature, the vertical hold of the monitor, changes in pitch and rhythm are triggered in the synth. A third photocell/oscillator is available for direct stimulation and is mounted on the synth’s case. Another method for expressively controlling this instrument is using the camera component of the baby monitor set: it can be pointed at different objects or parts of the room. It can also be used to glitch and distort the image by changing the frequency of transmission to the monitor.